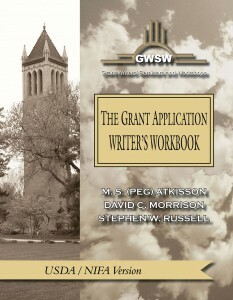 This version of The Grant Application Writer’s Workbook has been designed to help researchers write a competitive grant application to USDA – NIFA. It guides readers through use of the relevant Request for Applications (RFA) to inform the writing of a proposal, as well as how to develop an idea that will fit within NIFA’s programmatic priorities. The Workbook demystifies the concept behind, as well as the development of, an integrated proposal – one that brings together the three components that embody the USDA system: research, education and extension. Readers are led, step-by-step, through each component of an application. Use of the review criteria to inform the writing of the application is taught. Principles and fundamentals, as well as practical tips and strategies, are emphasized. How to convey significance and innovativeness of the project is also stressed. Examples are provided, after which the reader is asked to make comparable responses in his/her area of research interest. As each such response is made, the first draft of the application gradually falls into place. How to seek and use pre-submission review is covered, along with electronic submission of the application through Grants.gov, as last steps in the development process. The Workbook‘s content can be sampled by clicking on the open-book icons at the right. USDA-NIFA announced a new approach to making grant applications on March 11, 2015, which requires that we revise and update our Workbook. Sales of the new, updated version should begin again in May or June. If you would like to be notified when the newly revised USDA Workbook is ready, please provide your email address and we will contact you.